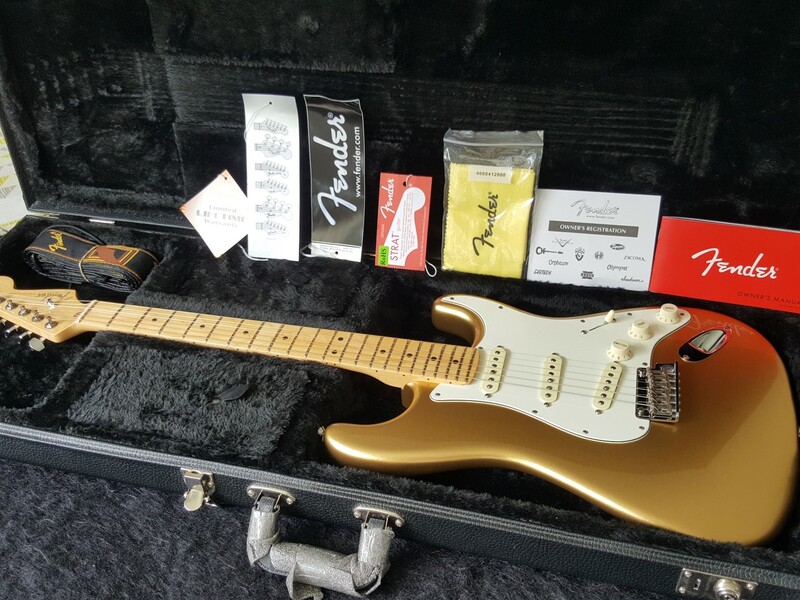 Mint condition, genuine Made in USA, slightly used 2014 Fender 60th Anniversary Limited Edition Standard Stratocaster Mystic Aztec Gold. I can not see any marks except some minor scratches on the pickguard. Includes Case, strap and all case candy. It has all the same specifications and the beautiful set up and superior fret work of an American standard, plus the addition of a special 60th anniversary heel plate where the neck joins the body. It really is a fine specimen. The Fender Limited Edition American tandard Stratocaster Electric Guitar celebrates sixty years of the Stratocaster with a beautiful Aztec Gold finish and parchment pickguard. Outstanding playing features include an alder body, maple neck and fingerboard, Custom Shop Fat '50s single-coil pickups, a two-point synchronized tremolo and nickel/chrome hardware.